This Car Stereo commonly seen in shop in need of repair for no or intermittent display and/or push buttons do not operate, CD's will not play. Please see our link to Shipping top and bottom of all pages before sending for repair. Din Tools can be purchased HERE. 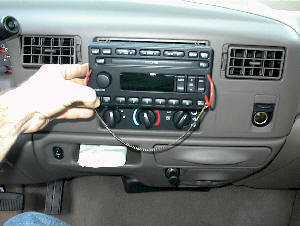 1) Insert "Din tools" into holes on both sides of radio. 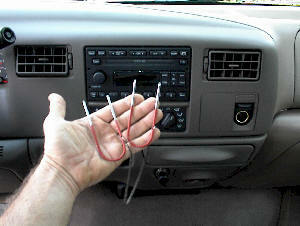 2) Push tools slightly to the outside of the car stereo, this releases the lock mechanism, pushing them to the side of the car stereo. 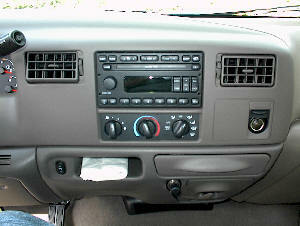 3) Pull unit forward from dash. 4) Remove antenna and connectors.